It is the year 2032 and Earth is a world where the few remaining humans coexist with cyborgs, human spirits inhabiting mechanized bodies, and dolls, robots with no human elements whatsoever. 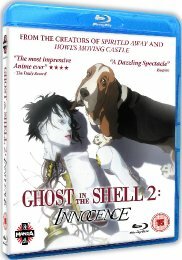 A cyborg detective for the government`s covert anti-terrorist unit Public Security Section 9, Batou is charged with investigating the bizarre case of a malfunctioning gynoid - a hyper-realistic female robot created specifically for sexual companionship - responsible for slaughtering its owner. Delving deeper and deeper into the investigation, Batou and his partner, Togusa, are forced to confront violent Yakuza thugs, devious hackers, influential government bureaucrats and powerful corporate criminals. As they move closer to uncovering the mystery, it slowly becomes apparent that the truth behind the crime is far more shocking than anyone dared imagine.